What does it mean to be predestined? It is that God foreknew us even before the world was created that the one who Loves him dearly would be here at a time he would appoint for us to show forth his praise within the earth! “For who he did foreknow, he also did predestinate to be conformed to the image of his Son, that he might be the firstborn among many brethren. Moreover whom he did predestinate, them he also called: and whom he called, them he also justified: and whom he justified, them he also glorified”. (Romans 8:29-30). To be called of God is a Great Honor.We pray for God to use us and when just a little turmoil comes into our life we forget this is part of what we have prayed for.Jesus didn’Ephesianst have a super easy life,because he was the Son of God.In fact his life was actually the opposite for they watched him constantly and tried to trip him up in the way he believed, was persecuted, laughed to scorn, spat on, and reproached and then died on a cross.Why should we think to walk in his shoes has changed? How can anyone think when Jesus said: take up your cross daily and follow me mean anything else? 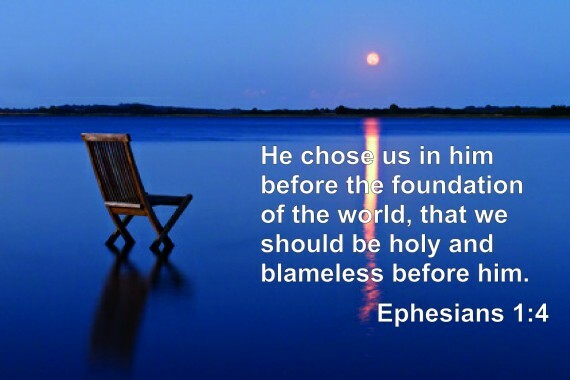 It is God’s will that his children were adopted and were chosen in Christ, before the foundations of the world. “According as he hath chosen us in him before the foundation of the world, that we should be holy and without blame before him in love:Having predestined us unto the adoption of children by Jesus Christ to himself, according to the good pleasure of his will, To the praise of the glory of his grace, wherein he hath made us accepted in the beloved. In whom we have redemption through his blood, the forgiveness of sins, according to the riches of his grace. In whom also we have obtained an inheritance, being predestined according to the purpose of him who worketh all things after the counsel of his own will: That we should be to the praise of his glory, who first trusted in Christ”. (Ephesians 1:4-7,11,12). The prophet Jeremiah was known of God even before he was in his mothers womb and God had sanctified him. There’s no denying the thought’s of God with this passage, he most definitely guided Jeremiah! “Before I formed thee in the belly, I knew thee; and before thou camest forth out of the womb I sanctified thee, and I ordained thee a prophet unto the nations. Then said I, Ah, Lord God! behold, I cannot speak: for I am a child. But the Lord said unto me, Say not, I am a child: for thou shalt go to all that I shall send thee, and whatsoever I command thee thou shalt speak. Be not afraid of their faces for I am with thee to deliver thee, saith the Lord. Then the Lord put forth his hand, and touched my mouth. And the Lord said unto me, Behold, I have put my words in thy mouth. See, I have this day set thee over the nations and over the kingdoms, to root out, and to pull down, and to destroy, and to throw down, to build, and to plant”. (Jeremiah 1:5-10). We are the predestined which preach Christ crucified to a world that see’s this as foolishness, but God has said to those who are saved it is the power of God! and foolishness to those who are perishing “For the preaching of the cross is to them that perish foolishness; but unto us which are saved it is the power of God”. (1 Corinthians 1:18). Never stop doing the will of God who has called you from darkness into his marvellous light. “Therefore, my beloved brethren, be ye steadfast, unmovable, always abounding in the work of the Lord, forasmuch as ye know that your labour is not in vain in the Lord”. (1 Corinthians 15:58). ← Will The Changing Demographics Of America And The Church Escape God’s Judgement?